The Sega Saturn Control Pad, later known simply as the Controller in North America, is primary method of user input for the Sega Saturn. It is an evolution of the Six Button Control Pad for the Sega Mega Drive and was originally seen in 1994 along with the Saturn console. It has a circular D-Pad, a button, and six face buttons; , , , , and . New to the Saturn is the addition of two shoulder buttons, and , which replace the Mega Drive's "mode" button to bring the total number of buttons to nine. Like the Mega Drive Control Pad(s), it is ergonomically designed for maximum comfort. 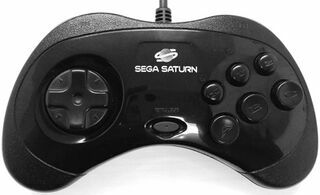 The Saturn controller debuted in Japan in 1994 and remained largely unchanged throughout the lifespan of the console. In North America and Europe however, a different, much bulkier controller was released to supposedly accommodate for the "bigger hands" of western consumers. This "MK-80100" control pad is functionally identical to its Japanese cousin, but is slightly larger and has a peculiar concave D-Pad, not seen in a Sega console since. This particular model is often regarded to be worse than the Japanese variant, and was replaced entirely during the summer of 1996, cutting costs as the console was redesigned. There are many slightly different colour variations of the controller, mostly to match the colour of the console. Japan initially received grey pads, but eventually saw white and clear varieties as well as those designed for V-Saturns and HiSaturns. In the rest of the world (bar Brazil), only black controllers were released. The Control Pad saw an "upgrade" in the form of the 3D Control Pad, built as a response to the Nintendo 64's analogue joystick. Main article: Control Pad (Saturn)/Magazine articles.